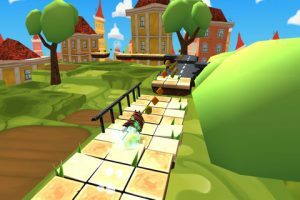 If you own an iPhone, there are a handful of games that you’ve probably played by now: Words with Friends, Angry Birds, and of course, Temple Run. 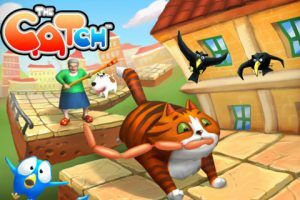 And if you liked the latter, then you’ve gotta check outThe CATch!, developed by Deemedya M.S. Ltd. 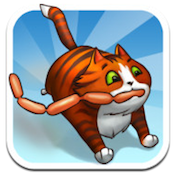 While it uses basically the same mechanics as Temple Run, The CATch! is a breed all its own. 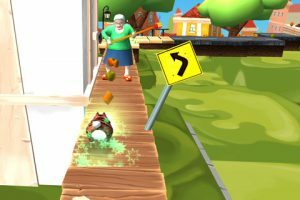 You play as a tubby, chubby, totally adorable cat who gets chased out of his home by his owner after he tries to steal some sausages from the kitchen table. In addition to the grouchy grandma, you also need to look out for a dog and a group of nasty old crows while you attempt to earn coins, special bonuses and power-ups. 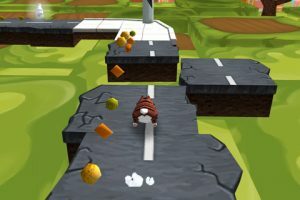 The controls and environments are virtually identical to Temple Run, with a couple of differences. Most notably, The CATch! lets you walk on walls. Also, you’ll have to walk across very, very narrow spaces, which will involve tilting the phone from side to side to stay on track. Now, about those controls: they don’t feel as smooth as Temple Run, making the gameplay a little more stressful than it needs to be. While flicking motions to jump up over gaps or flicking down to slide under an obstacle work very well, tilting controls seem choppy and could use some refinement. As you progress in the same, you can try out other cats, each of which has its own unique strengths. Challenge your friends on Facebook, and the game gets even more fun. If you like Temple Run and are looking for a new iPhone game in the same vein, The CATch! is worth checking out, even if it has some control imperfections. The CATch!is compatible with iPhone 3GS, iPhone 4, iPhone 4S, iPod touch (3rd generation), iPod touch (4th generation) and iPad. Requires iOS 4.0 or later.A small expedite fee was paid by the developer to speed up the publication of this iPhone game review.